Artificial turf, how does it measure up to good quality natural turf? Way back in 2001 natural turf was assessed to index key performance parameters, these were used to put together the criteria for assessing the performance of artificial turf. The idea being to replicate good quality natural turf in the artificial turf being offered up by manufacturers. It is fair to say that natural turf at the elite end of the spectrum has evolved and stadium pitches comprising of natural turf are high tech surfaces which can be durable. The big change however is not just a qualitative improvement in the surface but a change in its sports performance when it comes to player/ball interaction. 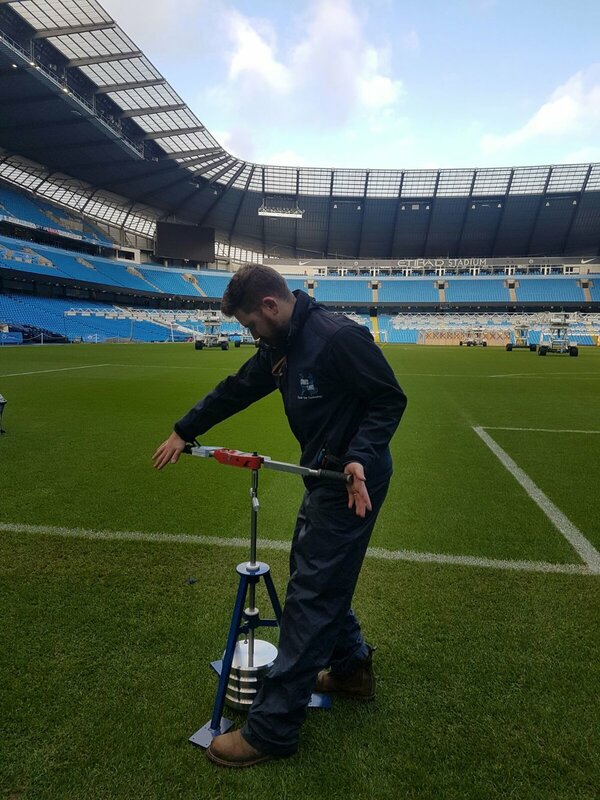 Looking at some key parameters which are of interest to those aficionados of artificial turf which can be measured in natural turf it is possible to get a clear picture of how the performance of natural turf is perhaps not replicated in today’s artificial turf systems! Using a regime of tests which are commonly used to evaluate artificial turf allows us to make direct comparisons between good quality natural turf and the certified* artificial turf. Testing using an advanced artificial athlete, head injury criteria equipment, traction, ball roll/bounce, clegg tester and GMax equipment means we can characterise key performance indicators which attempt to mimic player/ball surface interactions and therefore compare directly the performance of natural and artificial turf. The increased use of ‘hybrid’ turf systems such as woven and or tufted artificial turf textile into which a root zone is applied. Or natural turf sown and grown in and injected artificial fibre systems (which have been around for a long time) that are available through several providers has added a new dynamic to natural turf systems. 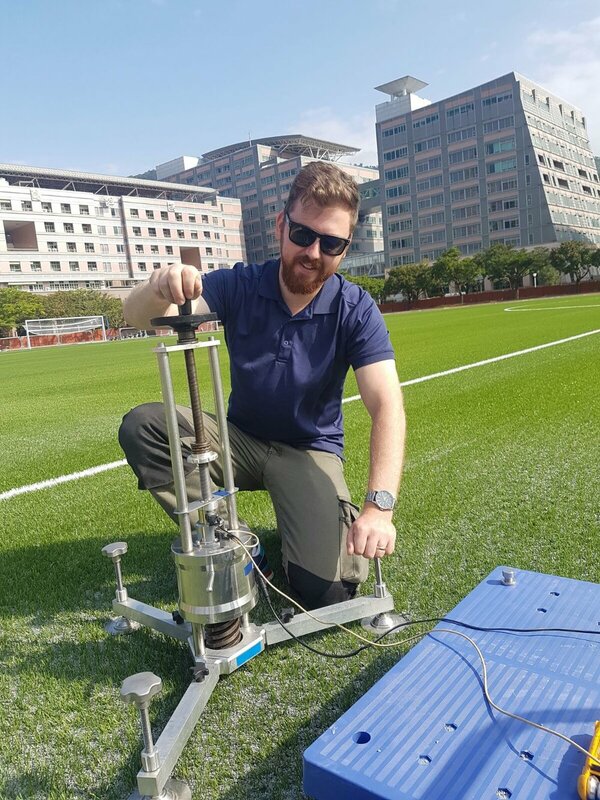 The results of any testing protocol carried out on both natural and artificial turf must by the nature of these systems take in variation which is manufacturer/environment lead or influenced by the type of natural pitch surface that has been constructed. The testing that we have conducted could be considered a snap shot of the performance of either turf system but in the analysis, seasonal variation and a large sample base has been evaluated this includes the fact that the artificial turf systems assessed were all targeted at a certified level. Here we can see that all natural surfaces are considerably firmer than the artificial turf assessed. Good quality natural turf unaltered by synthetic fibre and or textile is the closest comparable surface but is still firmer than most artificial turf. Of interest is the considerable variance that can be observed between hybrid surfaces and artificial surfaces. Here we can see that all natural surfaces are considerably stiffer than the artificial turf assessed. Good quality natural turf unaltered by synthetic fibre and or textile is still the closest comparable surface but is still stiffer than most artificial turf. Of interest is the considerable variance that can be observed between hybrid surfaces and artificial surfaces. Here we can see that all natural surfaces exhibit less traction than artificial turf systems. The fact that artificial turf offers slightly more traction (grip) than natural turf is well documented. Here we can see that the energy restitution for natural turf systems is very low; here we are trying to assess how much of the kinetic energy remains for the object to rebound from one another vs how much lost is lost as heat, or work done deforming the objects. 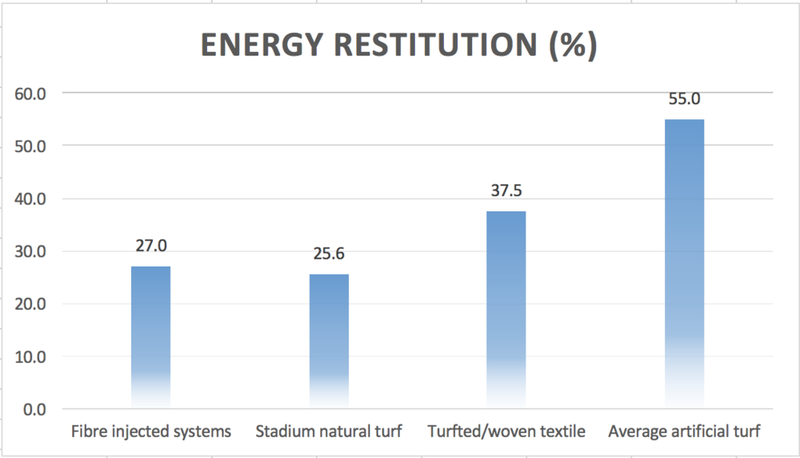 Energy restitution is set to become one of the most important parameters we measure from the player/surface interaction in the future. Here we can see that all natural surfaces exhibit a greater ability to absorb the impact from a head/surface collision than artificial turf. In studies conducted on player concussions the surface has been found to contribute up to 30% of the total concussions sustained by player using either natural and or artificial surfaces. The study which focused heavily on player/surface interaction produced interesting findings when we look at how natural turf surfaces perform when compared to artificial turf systems. The question now may be, do we need to start to look at the criteria which is set for artificial turf and review this? Anecdotal evidence from players does suggest that firmer surfaces which still offer good shock absorption properties are the surface of choice. This subject given the apparent variance between good quality natural turf when compared with artificial turf does appear to warrant further research and assessment. It should be possible to suggest proposed criteria for artificial surfaces, it would be of interest to examine how current systems measure up to this. Table shows current and suggested limits which could be considered. The main issue would appear to be the feel of firmness or stiffness underfoot. Adding HIC could be considered to reduce the contribution the surface has to occurrence of concussion in the game. The jury is out when it comes to energy restitution as further studies are required to characterise this property. Rotational resistance looks about right at present limits. Food for thought?